The abdomen has three layers – skin, superficial fascia and muscle. The abdomen houses important organs in the body. It is an essential area of study for doctors when they are assessing pain and illness in patients. The body of the abdomen when viewed from a frontal view is divided into nine imaginary planes, in both vertical and horizontal directions. The nine regions of the abdomen can help determine specific ailments and are of clinical importance. Three horizontal lines and two vertical lines create nine regions of the abdomen. 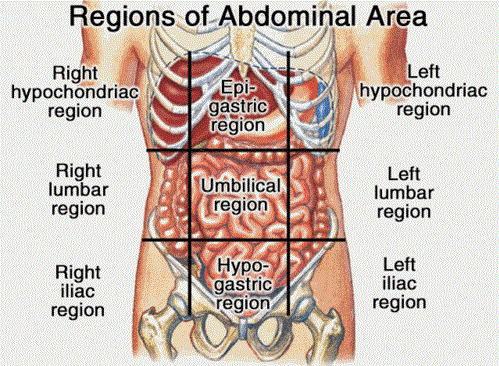 Below is an image of the regions of the abdomen, which are formed within these planes. “Hypo” refers to “below”, “epi” refers to “above”, “chond” refers to the cartilage of the rib and “gast” is in reference to the stomach. Below is a reference video, which explains the differential diagnosis of abdominal pain according to the abdominal region. 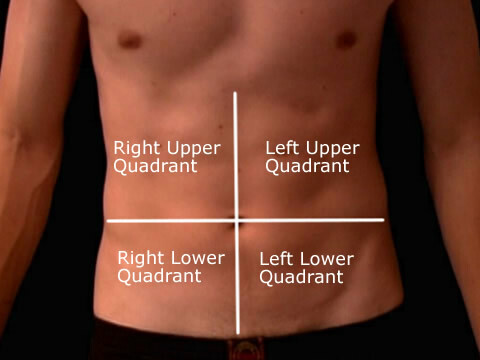 This video explains the quadrants of the abdomen. It also discusses which issues can occur in each of the quadrants and regions of the abdomen. Doctors often assess this portion to localize pain and tenderness. Organs found in this quadrant include the liver, the gall bladder, duodenum the upper portion of the pancreas and the hepatic flexure of the colon. The RUQ is commonly tender in cases of hepatitis, cholecystitis and with the formation of a peptic ulcer. The right lower quadrant extends from the median plane to the right side of the body and then from the umbilical plane to the right inguinal ligament. Important organs found in the right lower quadrant include the appendix, the upper portion of the colon, the right ovary and Fallopian tube in women and the right ureterpenus. The right lower quadrant may be assessed when diagnosing appendicitis in which case this quadrant would be tender and painful. The left upper quadrant rests alongside the RUQ. The left upper quadrant is formed by the median plane extending to the left of the patient and with the umbilical plane to the left rib cage. Organs found in the left upper quadrant are the stomach, the spleen, the left portion of the liver, and the main body of the pancreas. The left portion of the kidney and the adrenal gland are also found in this quadrant. The splenic flexure of the colon and the bottom portion of the colon also sit in the left upper quadrant. The LUQ will be tender and a point of interest in cases of appendicitis and abnormalities of the intestines such as malrotation. The left lower quadrant is located below the umbilicus plane. Essential organs found in this region include the bottom portion of the colon, the sigmoid colon, the left ovary, Fallopian tube and the left uterine tube. The doctors will assess this area if there is abdominal pain in this region. Abdominal pain in the LLQ may be a symptom of colitis, diverticulitis, or ureteral colic. Pain in this region may also be caused by ovarian cysts or a pelvic inflammation. Tumors found in this region can be serious determinants of colon or ovarian cancer.